Select Quantity 1 2 3 4 5 Supprise her! Share the sweetest treat with your loved o­ne o­n Ladies' s Day with our special milk Cream Cake ( ~9" dia. 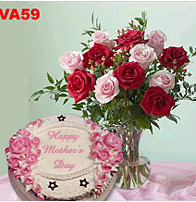 and 2 " tall) with words " HAPPY VALENTINE'S DAY" and a dozen fresh cut roses beautifully arranged in a clear glass vase.